Pretty uneventful lately. Christmas was nice with all the Tuthills. I quickly made a scarf for Makayla that morning. She appeared to like it. We received some money and gift cards for baby stuff. Thankful for that so I can go buy some diapers and such. Had my first cervix check earlier in the week. Nothing to report there, no dilation yet. Did have a small contraction while hooked up to monitor, which I didn’t feel. Baby was moving around at the same time so I’m not sure if That is why I didn’t notice. The last 2 weeks have been a bit of a roller coaster for me. Nothing bad, really, but with the short week this week and 3 appointments last week, I feel I’ve been all over the place! Kind of have really. So going back to week 31, I had my first non-stress test and another growth scan to check baby weight and such. The non-stress test is to put monitors on the belly to check baby movement and heartbeat. Need to have so many movements in a specific time frame and they like to see variance in heartbeat rhythms. So that went well and next day I met with our new pediatrician. I didn’t really have a lot of questions to start out with, I’m sure more will come along. But he is a very likable guy and I think baby will be in good hands. Then the 3rd day of appointments was my next NST with my OB. Again, fetal movement and heartbeat all good. Dr A is very pleased with progress and thinks things are going very well. So, of course I’m happy to hear that. Especially cause I feel like I’ve been a REALLY bad eater lately. I started off the majority of this pregnancy doing so well, making great food choices and frankly, I’ve become QUITE lazy. I need to be better, not just for the baby but for myself as well. That is probably the one thing I’m looking forward to most about the new year, besides the baby is staying home and being able to cook and make meals for us. I know they will be healthier options than what we have now. Thankfully I pushed Brian for a physical recently (mostly to save money on our health insurance), but at our ages, it’s good to do anyway. And while is cholesterol numbers weren’t too horrible, they could be better. His BP is what concerns me most and I know a large part of that is due to smoking. So hopefully with baby coming he will make a better concentrated effort to quit. I told him back at the positive pregnancy test he had nine months. Let’s see if he’s serious. Then this week, had another NST on Monday – which I promptly forgot about, until an hour later (whoops!) and they were able to still get me in, so that one again, good. And since the office is closed for the holiday (thurs and fri), I have to have the next NST at St. Anns. Normally I would go to the MFM (maternal fetal medicine = high risk) clinic, but they are booked pretty solid, so I actually have to go to labor and delivery. So I’ll actually get to see the birthing rooms before our hospital tour, which is next week (7th). I was told to call ahead though to make sure they have a bed available and aren’t all booked. The appointment is at 2PM which is a little annoying because it’s right in the middle of they day and quite frankly normal day off naptime. Oh well, I’ll manage. And did you think I was done with appointments, oh nooooo….. On Tuesday, I had the 2nd and final Fetal Echo – which is a highly detailed ultrasound of baby’s heart. This is at children’s hospital. It was ok overall, but a little bit of depressing news. First, I had one of these scans several weeks back and it wasn’t entirely conclusive about a possible problem – Aortic Coarctation (which is on wikipedia, but the dr.s description was much easier to understand). So, not a big deal at this point, nothing to fret over, until I got the bill. YES I have insurance and they paid 80% of it, but my portion was still a lot. Especially considering I KNEW I would have to have another. I was unsettled. But it’s what I have to do, so I go again and don’t cancel (I really wanted to) and guess what, still inconclusive, no answers, positive or negative and another HUGE bill on the way for me. Just is infuriating really. Anyway, the gist of the potential problem is this, in diabetic moms, babies can have heart issues, where the RIGHT side of the heart in enlarged, which causes the left side to have to work harder and can also cause a narrowing of the aorta (which is on the left side). Again, this causes stress on the heart and can cause downstream problems if not caught or fixed. Basically if we didn’t know and left the hospital, baby could get very sick in a few days of being home. Since we have no answers now, what they will do is give him an ultrasound before we leave the hospital, if the problem is present, he would get transferred down to children’s hospital to have the surgery to widen the aortic valve and I’m not sure about anything after that as far as recovery and going home, etc. But I’m hopeful the problem won’t be present at all. And we can just have baby, come home and be happy. 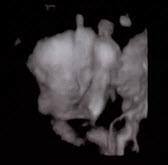 There are a couple of reasons the scan can’t really tell at this point, mostly because of baby’s position. He’s definitely head down, maybe not quite vertical I think he is slightly diagonal, but they just couldn’t get a great position to look at what would be the back side of the heart to see the Aorta part that they need to see. Again, I’m not worried yet about what is going to happen, cause I know we will deal with it as it comes along, I’m just stressed about money right now because, well considering how much the scan at children’s was, I can’t imagine how much OPEN HEART SURGERY will be. Good grief. Best not to think of it at all and again, we will just hope for the very very best outcome. SO that now brings an end to the appointments the last 2 weeks. And… also I do have the NSTs, twice a week every week until he arrives, so I’ll be on the go a bunch. Luckily work isn’t too high pressure right now, but I can see us getting much busier as the training for the new people wraps up and their GO LIVE date is 12/16. So it should be a very interesting December. In better news, I finally bought a couch! Of course that didn’t go off without its own problems, but nothing to earth shattering and hopefully the company will honor their commitment and I will get it on time (basically before baby). Again, a huge outpouring of money, but we’ve needed this for years and I’ve put it off for far too long. And since it’s thanksgiving week, let me say a few things about that. I’m thankful for still having my job although I won’t for much longer, it’s afforded me things like paying all these medical bills on time and buying the new couch and getting prepped for baby. Also for the very generous friends and family that have surrounded me with gifts either new, handmade or hand-me-downs. I would definitely be so much worse off if I had to do all this myself. I am so grateful to all these people – just amazed all the time. And hopefully when the decisions comes to either have another child or just stop with the one we are getting, I can find a great place to donate back all the generosity I’ve received. I would love to be able to help others with all these wonderful things they may be gently used. I’d hate to give to good will where someone else would have to buy it, but if I could find a family in need that can take these things or families, that would make me feel much better. Again, have a while to sort that out. But again, grateful for family and friend and my husband, who is a pretty great guy. I do complain about him a lot but at heart I couldn’t have a better person. He does have his issues (most people do) and most stuff I can live with but at the core, he is very caring and generous and puts up with most of my BS (I’m quite demanding you know) and for that I am very thankful. I know we will have arguments to come on how to raise this child and about money and all things that go with living together… but we’ll continue to grow and learn and make it work cause that is what we do. Not every day can be a good day… but I think there is a little good in at least every day. I hope to really focus and remember those good moments and be able to share them. Case in point, yesterday (thanksgiving), we had our annual dinner at Scot and Joe’s place. I asked Scot to make the Turkey this year because a. it’s hard work and b. I didn’t think I’d have the energy to pull it off. And boy was I right. I only made a few sides and was purely exhausted by it and I did some stuff on Wed night. Anyway, it was a great feast enjoyed by everyone. So I guess next up is Christmas which hopefully will be a low key affair. My moving around with this extra belly has been fairly slow and with the rate this child is now growing I can only anticipate it being worse and more uncomfortable. Hopefully I’m over exaggerating and it won’t be too bad, right?! HA! So just under 6 weeks to go… can’t wait to meet my baby boy! We found out several weeks ago that our baby is a BOY. Something I had felt from the beginning for some odd reason. Anyway, now i can continue to plan what type of quilt to make and perhaps more knitting items that aren’t in pretty girl colors. I’m definitely excited to meet this little person. Our appointments have been going pretty well. I had an “anatomy scan” a few weeks ago at MFM (high risk clinic) where they took measurements of lots of parts and looked inside to see his internal organs. Everything looked to be ok. He was measuring a little big at that point. Because he was lying transverse (horizontal with his belly down), I had to go back again to get additional measurements. They made a few 3D images like the one above. Today he measured to be 1lb 5 oz. and is in the 55th percentile. In another 2 weeks I’ll go in for a fetal echo (at children’s hospital). This is to ensure there are no problems with the heart. A few weeks after that I’ll go in for a growth scan (at MFM). Again to see how big the baby is. That should be around 28 weeks. In speaking with Dr. Arora last week at my normal prenatal visit, we talked about WHEN I would be delivering and he thinks around 38 weeks, so hopefully on/around 1/6/14, the little mister will be here. And that is only 15 weeks away. January seems kind of far off, but 15 weeks SOUNDS like it’s right around the corner. Have a ton to do around the house still. Hopefully I’ll begin feeling a little more motivated to do so. In any case other than feeling nauseated about some foods (even thinking of them). I’ve been feeling ok. A little stiff and sore in spots and still not sleeping entirely well, but over all, not as bad as I’ve heard others. SO I got painfully behind on my block of the month progress. I have 4 different BOM projects going. All fairly easy except, I just haven’t dedicated the time to sewing. Last couple of weeks, I’ve been trying to rectify that, so I have made some progress finally. I started off with the buck a block BOM (which is turquoise, cream and green), the craftsy BOM and finally the Red Soiree (from Red Rooster quilts). The red soiree is all these different red and cream print fabrics and I just fell in love with it. It comes in 2 color choices, red and blue. I had a hard time at first until I went to the shop and saw the completed red quilt and my choice was made. Anyway, I messed up the first 2 blocks. The first block because I cut things incorrectly and the 2nd block, pieces were cut correctly however, when I started sewing them, I messed up. So basically fail. I set it off to the side and continued on with other things. I finished 2 months of the buck a block. 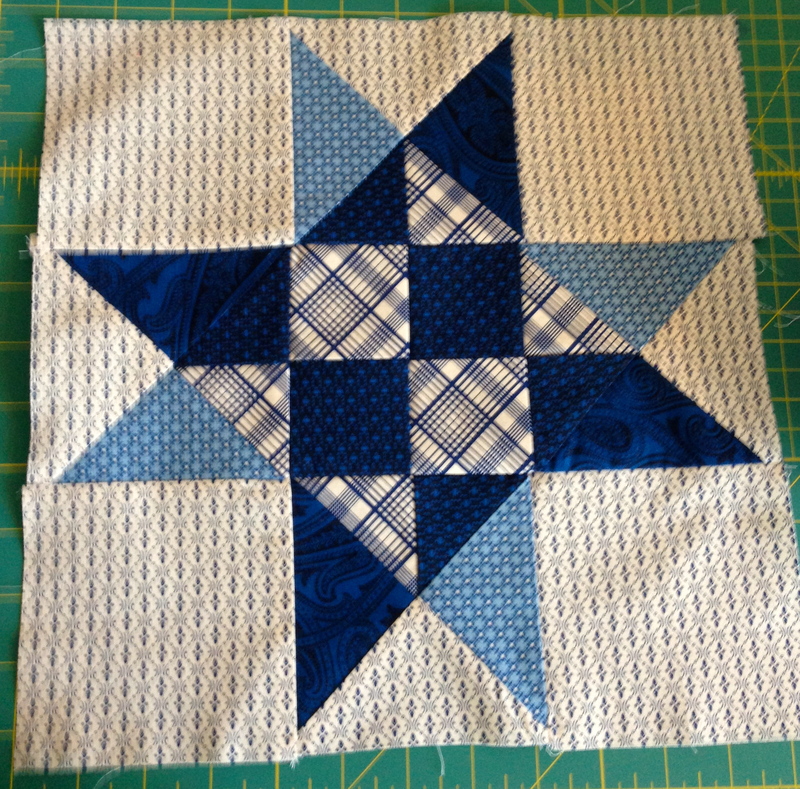 Then I decided, why not do the blue quilt too. So in month 5, I went back to Red Rooster and signed up for block 5 and was able to pick up those 6 blocks at once. I have now completed Blue 1 and Blue 2. Also, Red 3 and another buck a block. So, slowly I’m making progress. 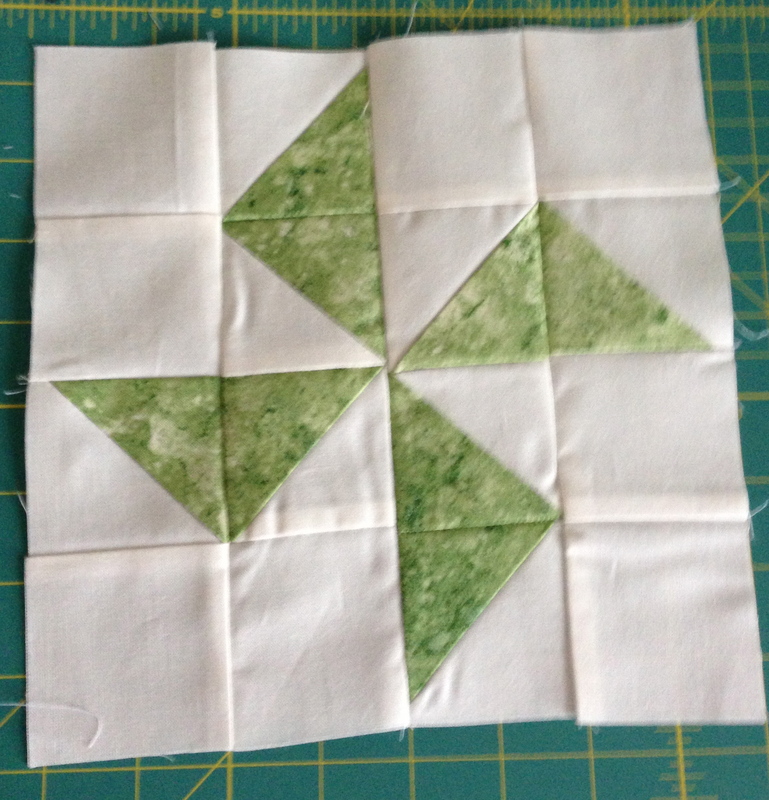 Perhaps tomorrow, I can do a couple more of the blocks. Pics are below. So far so good. Still no nausea, morning sickness, etc. Been feeling pretty good emotionally and physically ok, except for a few aches and maybe “growing” pains? I think some of my ab muscles are stretching or something… I’m not getting big at this point, but I think things are definitely shifting about to make some room. Sometimes it doesn’t seem really real that I am actually pregnant because I don’t have all those common symptons. Don’t get me wrong, I’m thankful… but at this stage, a little reassurance would be nice. Cause I just don’t FEEL pregnant. I know in the months to come that will all change… and I’m sure I’ll be laughing that I even had these thoughts and wrote this down. I met my new doctor this week and I LOVE him. He’s very kind and a little silly. But even with the silliness he’s very serious and caring and wants the very best for my health and babys. I’m glad I was referred to him and I think we’ll have a successful partnership. I will see Dr. Lang on the side though too and they will work together regarding all my risk factors. I will have an ultrasound to check baby’s progress at week 10 (7/2). Around then, they may do the blood test for Down’s Syndrome. Dr. Arora asked me how I felt about it and quite honestly, I don’t care. I know it takes a little more to raise a special needs child, but would I love it any less? I can’t imagine doing so. So I’ll have the blood test, but I am refusing the amnio test. I’ll take my chances at that point. It’s nice to be prepared, I guess, but I’ll do whatever it takes in the end. Kind of feel the same about the cystic fibrosis test. Anyway… no new pics or anything fun to share. My mind has been racing with all kinds of baby projects… I feel like I have castonitis all of a sudden. I want to KNIT. ALL. THE. BLANKETS! I also need to plan a quilt to be sewn as well. 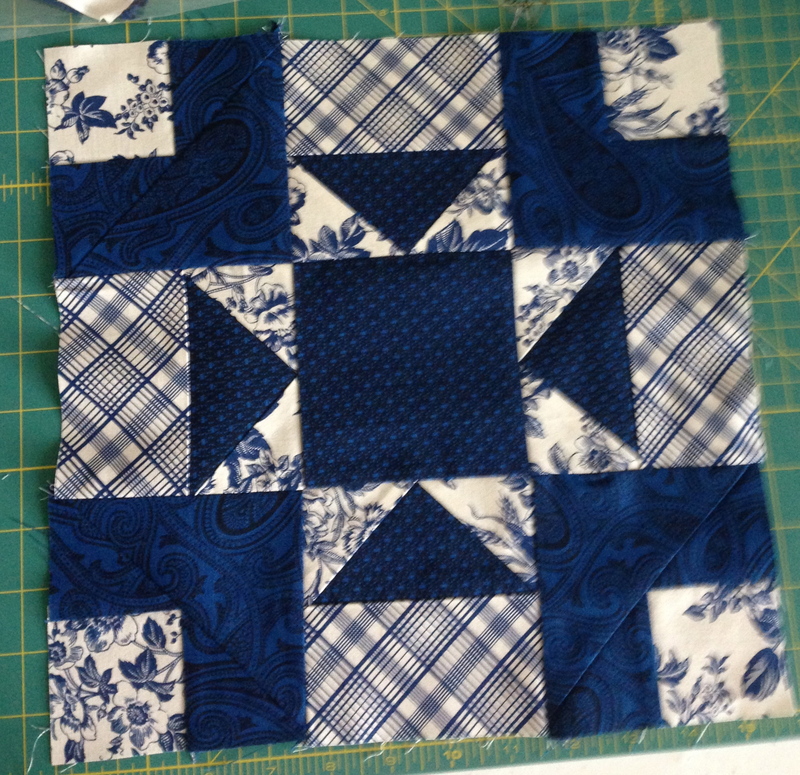 Speaking of quilting, I’m way behind of my blocks of the months… so very soon I need to catch up on those too! Oh and another trip to Grand Rapids is planned in 2 weeks. It will be nice to see the city out from under a blanket of snow!